New York Jets' Santonio Holmes (10) catches a pass for Buffalo Bills defensive back Justin Rogers (26) for a touchdown during the second half. Boy, that was ugly. And still, somehow, a win for the New York Jets. Geno Smith threw two touchdown passes, including a go-ahead 69-yarder to Santonio Holmes in the fourth quarter, and the Jets overcame a team-record 20 penalties to hang on and beat the Buffalo Bills 27-20 Sunday. Smith, who also ran for a score, slightly outplayed EJ Manuel in a matchup of the first two quarterbacks selected in the NFL draft. But this one was tough to watch with the barrage of penalties. The Jets (2-1) rolled up 158 yards in penalty yardage, and nearly gave it away against the Bills (1-2). Capping a drive kept alive by four straight penalties on the Jets, Manuel connected with Scott Chandler for a 33-yard touchdown, then hit Stevie Johnson with a pass for 2-point conversion that tied it at 20 with 10:39 left in the game. But Smith got the Jets right back onto the scoreboard with his big heave to Holmes, who broke away from Justin Rogers as he caught the ball and zipped into the end zone. Holmes had a career-high 154 yards receiving. Rex Ryan lost two challenges in a span of three plays in the third quarter and it ended up hurting the Jets. Manuel scrambled for 21 yards but lost the ball when he was hit by Dawan Landry and Jaiquawn Jarrett recovered. But officials ruled Manuel was down — and Ryan had no more challenges, with replays showing Manuel appeared to fumble. New York then had a horrendous sequence of four straight penalties, three on Kyle Wilson, who was benched briefly after the last of the calls. That kept Buffalo's offense on the field. It appeared Fred Jackson also had a fumble during the drive that the Jets recovered, but penalties also negated that and put the Bills in position to tie. Smith, the second quarterback drafted at No. 39, finished 16 of 29 for 331 yards and also had two interceptions. Bilal Powell ran for a career-high 149 yards on 27 carries. Stephen Hill also caught a touchdown pass from Smith. Manuel, who went No. 16 overall as the first quarterback drafted, was 19 of 42 for 243 yards and the score. It was a costly defeat for Buffalo, which lost cornerback Leodis McKelvin to a hamstring injury, defensive tackle Marcell Dareus to an ankle injury and defensive end Alex Carrington was carted off late in the game with an apparent left knee injury. Running back C.J. Spiller also left with a knee injury and finished with just 9 yards rushing. Smith was sharp on the Jets' first possession, marching New York 80 yards and converting three third downs before punching it in himself from 8 yards on a quarterback draw to make it 7-0. Dan Carpenter's 37-yard field goal made it 7-3 in the second quarter. Buffalo got the ball right back when Smith lofted a pass for Holmes into double coverage and was picked off by former Jets safety Jim Leonhard. 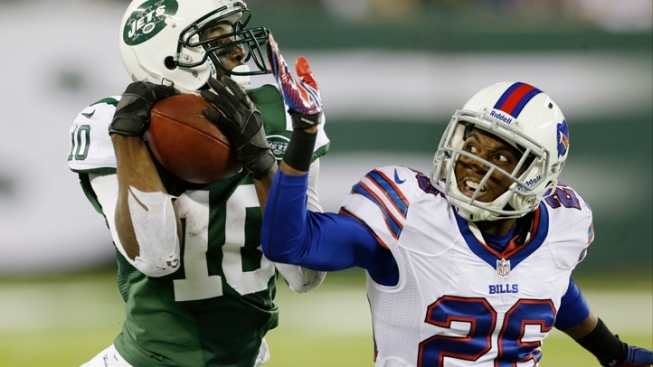 A facemask penalty on Jets guard Vladimir Ducasse put Buffalo at New York's 21. Carpenter made a 23-yarder to cut it to 7-6. The Jets took a 14-6 lead on a pretty pass from Smith, who hit Hill in stride for a 51-yard touchdown. Nick Folk kicked a 47-yard field goal into the wind to make it 17-6 as time expired in the opening half. Folk's 34-yarder gave the Jets a two-touchdown lead. Carpenter kicked a 43-yarder and added a 26-yarder a few plays after Kiko Alonso intercepted Smith on a poorly thrown ball.